DISTRICT OF COLUMBIA: ​​In a Tweet posted from his official Twitter account, Congressman Dana Rohrabacher urged President Trump to read and consider a plan created by the cannabis community for a southern border wall constructed from a hemp-based material, known as Hemp concrete. The plan also includes national cannabis legalization with a 3% federal tax that would fully fund the border wall, as well as a program to employ US Veterans in its construction. “A HEMP-BASED CONCRETE BORDER WALL (is) a win for USA security & taxpayers, farmers, veterans & environmentalists. Bold thinking!” Rohrabacher said in his Tweet, which he directed to President Trump, as well as Former White House Chief Strategist Steve Bannon and Blackwater founder Erik Prince. He added, “See @bud_trader white paper,” pointing the President and his staff to a white paper published by a cannabis social media site BudTrader.com. Rohrabacher’s statement comes in the wake of news that Bannon and Prince, along with other key Republican operatives, are developing plans to build a Hempcrete wall along the U.S./Mexico border, but are still seeking private funding for the project, according to POLITICO. 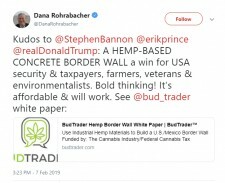 “According to Congressman Rohrabacher, he spoke to Steve Bannon and he is going to read the Hemp Wall white paper that BudTrader and the Cannabis/Hemp Community wrote,” says BudTrader.com CEO Brad McLaughlin, who originally proposed the hemp wall concept to Congressman Rohrabacher in April of 2018. McLaughlin’s proposal calls for federal legalization of cannabis (including for veterans and government workers) and a 3% federal tax on cannabis sales to fund the wall. BudTrader was in the news recently for offering Free Cannabis to federal employees during the government shutdown as first reported by The Hill. In the wake of The Hill story, BudTrader CEO Brad McLaughlin has been calling for Federal Employees to have safe access to cannabis, which is currently prohibited. “Federal Employees should have safe and legal access to medical cannabis. I can’t think of one reason why they shouldn’t”. McLaughlin formally submitted his Hemp Wall White Paper to then Congressman Dana Rohrabacher in September 2018 after a three day trip to Washington D.C. with the Congressman, where he was advocating for the Farm Bill and Cannabis Legalization on the federal level. He met members of congress and President Trump.